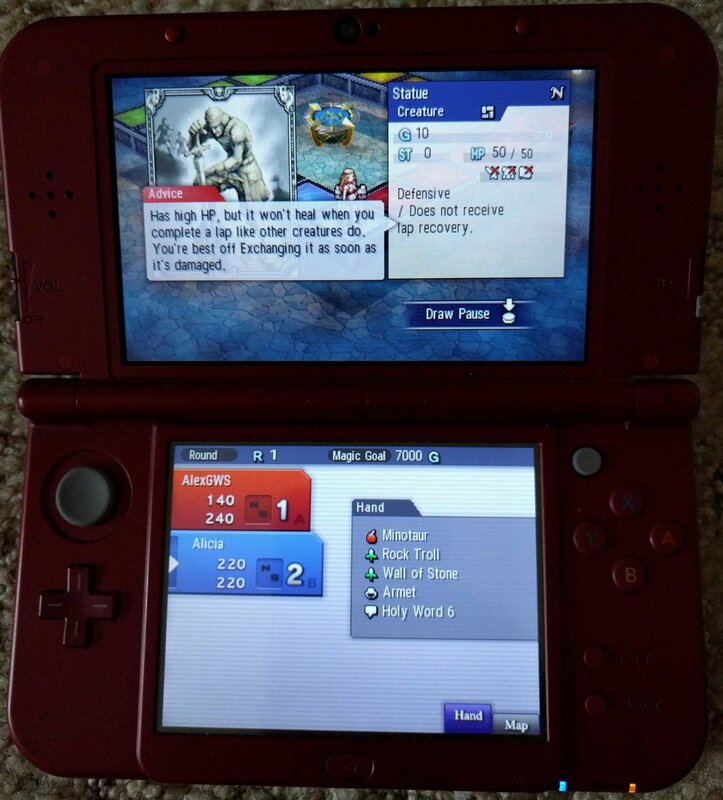 Culdcept Revolt Review - An Old Friend Returns on Nintendo 3DS — GamingWithSwag.com - Dads By Day, Gamers By Night. 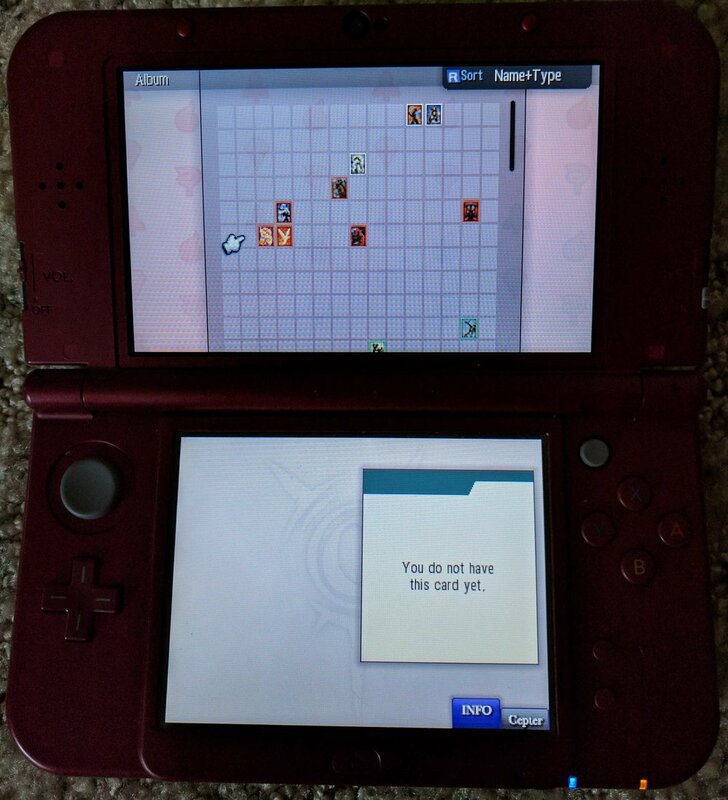 Multiplayer – Local & Online, all players must own a copy of the game and have a 3DS Family System. No hot seat multiplayer. High Level Premise: You’re an amnesiac with supernatural Monopoly powers, joined with a rebel group to take down a sadistic ruler – but only if you believe in the heart of the cards! Graphics/Style: 2D board game with illustrated cards and portraits. Has a fantasy/anime aesthetic that works well with the card game aspects. Music/Soundtrack: Pleasant or insistent, depending on your foe. Good background music that doesn’t get old, and you’ll want to keep volume up for sound effect cues for your opponents’ turns. Story: Your amnesiac character is introduced to basic Culdcept concepts by the protagonist group, the Free Bats. 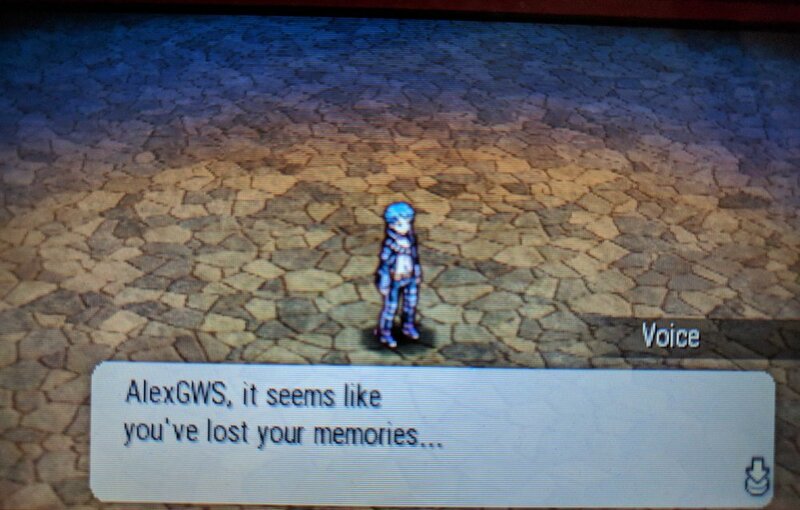 After a few tutorial missions battling your compatriots, your character begins missions to regain his lost memories and either escape from or defeat the evil Count Kraniss. Different factions of the Free Bats have different motivations, and I have not gotten far enough yet in 3 hours to see how the journey unfolds. Replay-ability: Once story missions are completed, you can replay them, changing your deck and strategy while earning yourself more cards. Multiplayer can be rewarding, provided you find opponents. Time Commitment: Depending on your dice rolls and deck, each mission can take from a half hour to about an hour and a half. You can suspend the mission at the beginning of your turn, or simply put your system in sleep mode if you need a shorter break. Value: With over 150 missions and multiplayer in the mix, there’s a lot of bang for your buck here. For best results, show this game to a friend and get them hooked! Favorite Element(s): I always liked the deckbuilding aspect of Culdcept. Earning more cards and evolving your deck makes every match a little different, and the incremental progress is very rewarding. I had forgotten how much fun Culdcept could be, certainly. To be fair, it has been a while since I’ve dusted off the PS2 or Xbox 360. Culdcept is an old friend of mine. I picked up the PS2 version based on the back of the box – it reminded me of the Pachisi minigame from Dragon Quest, or Magic: The Gathering, or some sort of fantasy Monopoly! The multiplayer possibility seemed ripe for my new college roommates and it only got better when Culdcept Saga hit Xbox 360. 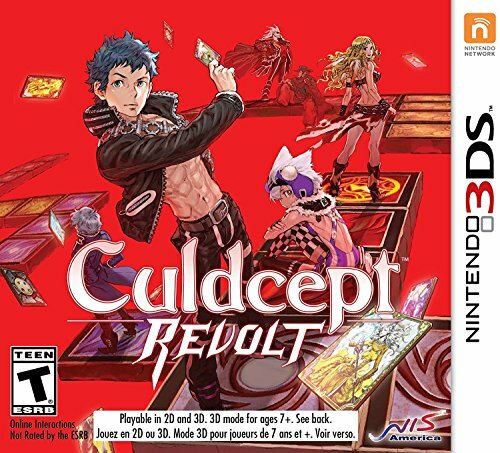 Now, around thirteen years later, Culdcept: Revolt arrives on 3DS. The story framework around amnesia gives the player a nice excuse to get schooled in the basic concepts. For me, this game plays like riding a bike, but the tutorials were good refreshers and went quickly. Alongside the tutorial is a mechanic called the Advice Cursor that really holds your hand by indicating a recommended course of action. Basically, if you follow the golden arrows, you’ll effectively be an AI character. For new players this is a useful feature, but you’ll want to wean yourself from it before you get into more complex decks. After the tutorials, you’re revealed to be in the care of a rebel group planning an escape from an oppressive city government. After a short discussion, your character decides to stick around in the hopes of regaining his memory. The story doesn’t seem especially robust, but I’m only a few hours into it and it’s not really why I’m playing anyway. Lots of stats, including a little advice balloon. Whenever an opponent draws a card, the game pauses to let you see what you’re up against. These tutorial features can be disabled by more advanced players. Gameplay is largely selecting missions from an overview screen. After a short story interlude that sets up the players, a match starts. Either 1v1, 2v2, or free for all, but largely the goal of each mission is to gain a certain amount of currency and pass the goal on the board. Other win conditions have appeared in previous games, but I haven’t seen any yet in the first few hours of this one. Players receive GP for completing matches, to be spent buying booster packs that improve your ‘Book’, or deck of cards. These are the creatures that defend your spaces (four primary colors and colorless), artifacts to defend them, and spells that do all sorts of things – from altering dice rolls to forcing your opponent to discard. The deckbuilding is where the game shines. You’ll find that certain opponents seem unstoppable until you slot some silver arrows into your book to give you an edge. When an opponent really favors a strategy that focuses on certain colors, it’s easy to put counters into your book – the challenge comes when you have multiple opponents in a match and only 50 cards in your deck. Ultimately the random nature of dice rolls and card draws will keep matches tense no matter how well you’ve prepared. As you can see, there’s a lot of cards available and I only have a few so far in my gameplay experience. I was hoping for some robust online play, but I never found anyone in the queue for matchups and I don’t have anyone local to play against. It’s unclear to me if there are no players yet, or if I just picked bad times to try to connect. I suspect players are simply working their way through the story first to get enough cards for competitive books. You do get a bonus card every day when you login, so there’s that at least. Available DLC is largely cosmetic – different avatars, dice and book covers for use in multiplayer. The gameplay experience is smooth and the UI works really well – if you wonder what a card does or what the state of the board is, the controls are intuitive. The second screen is used to great effect for information that used to be buried in separate menus, which keeps matches moving. The 3D effect is well done since there’s not too many moving parts at any given time, but is entirely optional as usual. The only hiccup I found with the UI is largely my own impatient fault – I tend to jam the A button when battles start and miss my opportunity to equip my creature with an item since the game defaults to ‘No Item’. Overall, there’s a lot of potential in this game. I know I don’t have the captive multiplayer audience from my college years, but the potential for online play is promising. The single player missions are plentiful in the meantime. 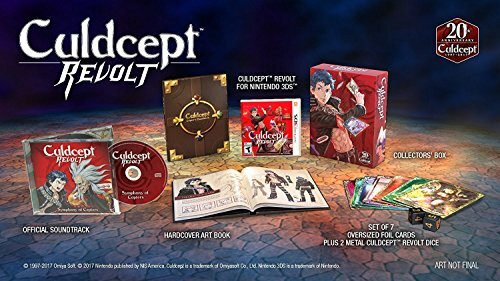 This is the best gameplay experience for Culdcept yet, and anyone looking for a collectible card game or board game will be pleasantly surprised. I suspect it will be a cult hit for the sunsetting 3DS library and I look forward to playing it for years to come! Buy This Game — Great execution of the CCG/Board Game premise, has a learning curve but with excellent tutorials.